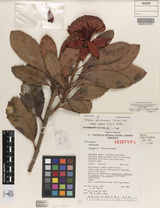 Description: Shrubs with 1–few erect, slender, few-branched stems to 3 m high; axes and especially lower surface of leaves moderately to densely rusty-hairy, the latter with 30–80 hairs per mm2. 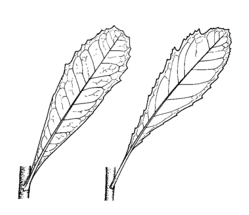 Adult leaves elliptic to obovate-elliptic or narrowly so, 8–28 cm long, 20–65 mm wide, apex usually acute to truncate, with 3–11 teeth extending below centre of either margin, more or less abruptly contracted to petiole, very leathery and harsh to touch, minutely granulate when dried; both surfaces with prominently raised veins. Conflorescences few, 90–250-flowered; basal flowers opening first; involucral bracts mostly 5–9 cm long, bright red. Body of follicle 8–15 cm long. Distribution and occurrence: Grows on sandy soils over granite, in dry sclerophyll forest, endemic to Gibraltar Ra.